We Provide all Range of Kryton Products to Clients all Over India. Krystol T1® is a surface-applied crystalline waterproofing treatment for concrete structures that is used to protect against the ingress of water. It is a dry powder, which when mixed with water becomes a coating that is applied to the inner orouter side of a concrete structure. 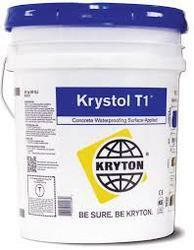 Krystol T1® may also be applied as a dry-shake to freshly poured concrete. Krystol T1® contains Kryton’s unique and proven Krystol® technology which reacts with un-hydrated cement particles to grow millions of needle-like crystals deep into the concrete mass. Over a period of weeks and months, these crystals grow, filling the naturally occurring pores and voids in concrete, and permanently blocking the pathways for water and waterborne contaminants. Later, if cracks form due to settling or shrinkage, incoming water triggers the crystallization process and additional crystals begin to grow, filling cracks and ensuring that the structure’s waterproofing barrier is maintained and protected. The concrete itself becomes the waterproof layer removing the need for any surface treatment. Krystol T2® system is a surface-applied crystalline waterproofing treatment for concrete structures that is used toprotect against the ingress of water. It is a dry powder, that when mixed with water becomes a coating that isapplied to the inner or outer surface of the concrete structure. Krystol T2® can be used in conjunction with KrystolT1® as a second coat or individually as a dry-shake broadcast to fresh concrete, or for coating on existing concretesurfaces. Krystol T2® contains Kryton’s unique and proven Krystol® technology which reacts with un-hydrated cementparticles to form millions of needle-like crystals. These crystals grow in a catalytic reaction, filling the naturallyoccurring pores and voids in concrete, and permanently blocking the pathways for water and waterbornecontaminants. Later, if cracks form due to settling or shrinkage, incoming water triggers the crystallization processand additional crystals form, filling cracks and ensuring that the structure’s waterproofing barrier is maintained andprotected. The concrete itself becomes the waterproof layer removing the need for any surface treatment. 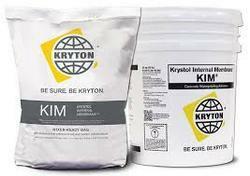 Krystol Internal MembraneTM (KIM®) is a hydrophillic crystalline waterproofing admixture in dry powdered form,effective in creating waterproof concrete. KIM is the STANDARD used for qualifying Permeability Reducing Admixture- Hydrostatic Conditions as specified by ‘ACI 212’ (Highest Grade of Permeability Reducing Admixture). KIM is used inplace of externally applied surface membranes to protect against moisture transmission, chemical attack andcorrosion of reinforcing steel. 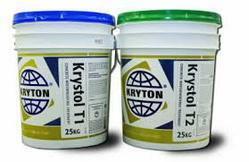 Looking for Kryton Crystalline Products ?